BenYishay, A., Mueller, L, Roessler, P. (2017). 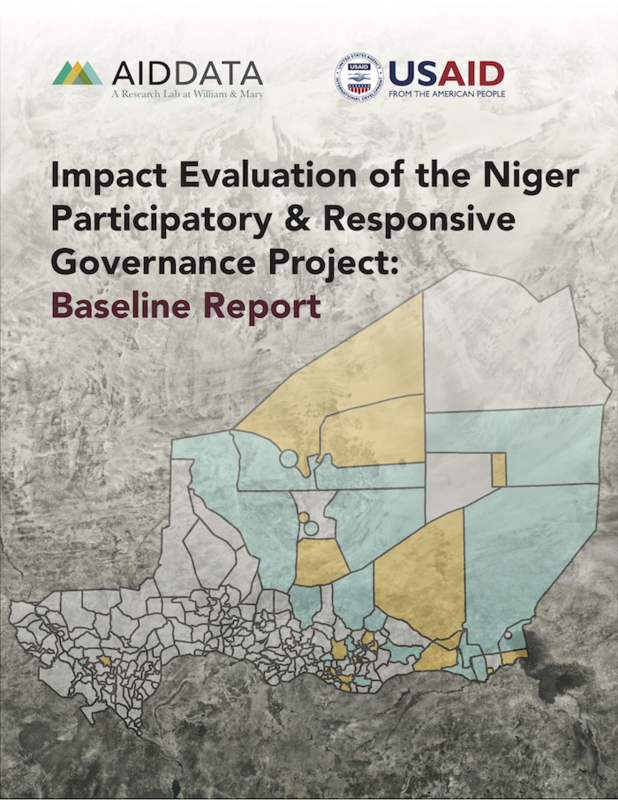 Impact Evaluation of the Niger Participatory & Responsive Governance Project: Baseline Report. Williamsburg, VA: AidData at William & Mary. Across most development indicators, Niger ranks close to the bottom of global rankings. Over the past three years, it has been second to last on the United Nation’s Human Development Index—just above Central African Republic. At root of the country’s perennial development crisis are unfavorable structural conditions. A second major challenge is the militarization, or securitization, of the state, in which military and security institutions represent the face of the government for many Nigerien citizens and divert resources from public administration. To help mitigate these governance challenges in Niger and bolster stability in one of the world’s most fragile states, USAID is investing in the Participatory and Responsive Governance (PRG) Project. To better understand how the PRG may affect governance in Niger, a team of researchers from AidData at the College of William and Mary have teamed up with the implementing partner, Counterpart International (CPI), to undertake a rigorous impact evaluation of the program. The impact evaluation focuses on the PRG’s multi-stakeholder dialogues that will bring together community leaders, municipal and regional councilors, private sector actors, professionals and citizens. The evaluation employs a randomized design to test this theory of change, in which the 24 communes where targeted activities be held were randomly selected from a broader pool of 48 eligible communes. The baseline surveys are valuable to gauge levels of perceived legitimacy prior to the implementation of the multi-stakeholder dialogues as well as to evaluate statistical balance between the control and treatment communes, highlighting the governance challenges Niger faces and the importance of the PRG program. Funding: This evaluation is funded jointly by USAID/DRG and USAID/HESN through a contract to NORC and a cooperative agreement (AID-OAA-A-12-00096) currently in place between USAID/LAB/HESN, AidData, and the College of William and Mary.